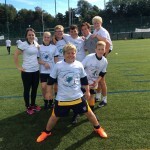 Rugby 4 Peace is based on the university’s Football 4 Peace International, the university’s award-winning project promoting peaceful co-existence in troubled communities. It has been operating in Israel, Palestine, Jordan, The Gambia and South Korea since 2001. 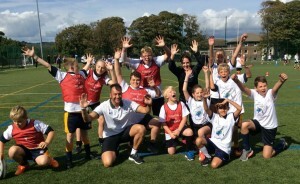 It uses sport as a tool to develop an awareness and understanding of trust, respect, responsibility, equity, inclusion and neutrality and its importance within society. 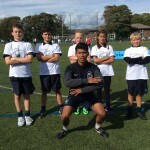 Coaches at the Falmer festival applied the Rugby 4 Peace curriculum during practical training and self-refereeing games sessions. 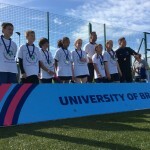 Dr Gary Stidder, co-founder of Football 4 Peace, said: “This was a fantastic celebration of how sport and education can influence young people in a positive way. This entry was posted in F4P England, News by admin F4P. Bookmark the permalink.